Today's Order "Visualizing what'in a head"
Just before the Golden Week holidays, a Japanese holiday week in May, there was a phone call from Mr. Makoto Watanabe of ADH architects. Born in 1950 in Gunma prefecture. 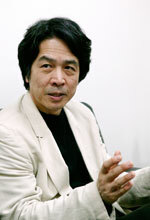 He graduated from Graduate School of Kyoto University in 1977 and Graduate School of Design, Harvard University in 1979. 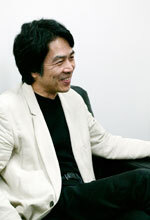 In 1981, he joined Arata Isozaki & Associates and in 1987, he founded ADH architects along with Ms. Yoko Kinoshita. Born in 1956 in Tokyo. She graduated from Stanford University in 1977 and Graduate School of Harvard University in 1980. 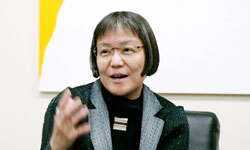 In 1981, she joined Shozo Uchii Architect and Associates and in 1987, she founded ADH architects along with Mr. Makoto Watanabe. Nakamichi: When I was thinking about a concept of this exhibition, the first thing that came up to my mind was to "create a photo set that visualizes an architect's brain." When an architect is creating a piece of architectural work, many ideas and elements converge and diverge in an architect's brain. I wanted to express such movements with a piece of photograph. The other thing was, "When visitors see the exhibited works, what are the elements that make them feel interested? And how do they respond to them?" Considering these factors, I thought it wouldn't be sensational enough to simply exhibit ordinary pieces. While thinking hard about it, I began to think, "When an architect is creating a new piece, what is the very first thing she does?" That's when an idea of "invisibility" came up. An idea of "invisibility" requires an imagination. When this analogy is applied to photography, it is a space where no image is printed. After a while, I realized that this "invisible" part could be a brain of Mr. Watanabe and Ms. Kinoshita. As a consequence, I thought, "By superimposing all elements of architectural pieces into one piece of work, it could express a brain of an architect." Then, I had made a sample right away and Mr. Watanabe's response was, "It looks great!" Watanabe: Instead of trimming a photo by 2m x 1m vertically and focus onto one part, I really thought the idea of superimposing would work out much better. Though many people talk about this method, it's not a widely practiced method. One may say, "It's not a special method and if you utilize a current technology, anyone can do it." But if you actually do it, you get to realize its fascination. Creative instincts and ideas become vividly alive when creating such piece. When it comes to a collage even a little kid can do it, but when a professional handles it its outcome turns out to be a piece of a professional work. Papier colle(*1) was invented almost a century ago. It is also known as a consequence of cubism(*2). By placing papers ?objects? on a canvas, it creates another dimension to an expression. Our photo work could be one of those kinds and certainly, there is more room for further expressions. By imitating papier colle, don't you think we should name our work "Photo colle"? Kinoshita: I thought Mr. Nakamichi's idea, a visualization of an architect's brain, is really interesting. While we design, we look at "part and whole" and "whole and part" just like two sides of the same coin. We could be focusing on one part, but we also have an image as a whole. As an architect, it's very original to see the process of switching whole and part views on one sheet of work. An artistic technique that places papers, objects and painting on one canvas. Picaso is one of the inventors. An attempt to express 3 dimensions on a 2 dimensional world by drawing one object from many perspectives. Kinoshita: There is definitely an advantage on a monochrome image. It allows drawing more attention of viewers. A colored image is usually distracted by its color and it's hard to concentrate. Nakamichi: Since there's no color, there is a space to imagine what colors they actually are. Watanabe: It also stimulates our imagination. Nakamichi: Even the time I was creating a sample piece for this project, I was thinking this would be a monochrome work. Colors are non-existent. Kinoshita: That's right. There's no color. When I am thinking about a space, it doesn't necessarily be correlated with colors. Watanabe: When people think the essence of architecture, colors are obviously one of the important factors, but sometimes, it would be better to express with monochrome images. By expressing in this way, the images are no longer showing a reality. One can express to viewers, "It is not showing the reality as it is." This reality is reconstructed with many perspectives, so the viewers can also perceive the information with many perspectives. It seems that the visitor of this exhibition, no matter if she is a professional architect or not, had an enigmatic affinity to the exhibits. When it comes to an architectural photography it is hard to grasp unless you are a professional. But they have multi-perspectives and therefore, there's more freedom to perceive the images. In that sense, I thought it would be more accessible to the viewers. Kinoshita: It's maybe because I designed these architectural works -- I won't get bored with these images. Actually, the more I look into them, more I get to realize "Oh, this part is that." and depending on the viewer, the focus would be different. I think that's the nature of an artwork -- you can combine your personal experiences. This work has a similar element and if you just look at it superficially, it is interesting enough, but when you look at it with depth, you get to see more perspectives. Just like an artwork, there is a depth and that's what fascinates me. Watanabe: Through these pieces of work, I feel that the entire image becomes ambiguous and I think that is interesting. I'm not saying that an ambiguity as a negative element. For instance, one of the architectural works used for this project, "Apartments Shinonome Canal Court". With an architectural understating, how I understand this piece of work is ultimately ambiguous. When you are looking at an image of one building block, you get an impression as if it is a complete form. But when you look at these exhibits, the impression I get is, "There were also many other elements." There's a work by Mr. Hiroshi Sugimoto(*3), who is well known for taking out-of-focus photography. What's so great about his work is that an essence of architecture is hidden in there, and that's something similar to Mr. Nakamichi's work. Mr. Sugimoto is creating this sort of photograph intentionally and I like an ambiguity hidden in there. Kinoshita: I agree with you. Instead of seeing an architectural photography with one focus, I think a blurred image stimulates my imagination. It has an effect to create more imaginations. Watanabe: But when you actually get there, don't you think it is accidental? orn in Tokyo in 1948. A photographer based in New York City and Tokyo. His main works include Architecture series, which features renowned architectures from all over the world, and Theater series, which features natural light. He has received numerous awards, including Mainichi Art Award and in 1989 and Hasselblad Foundation International Award in Photography in 2001. Nakamichi: When you begin a project do you use CAD? Or do you just sketch? Kinoshita: I am not good at using CAD so when it comes to CAD works I rely on my staff. Nakamichi: Wow! Your sketch work is faster than a computer. 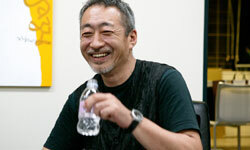 (laughter) Do you sketch as well, Mr. Watanabe? Nakamichi: Don't you think that sketching work is the time when you can enjoy the most? You get to create something from scratch. Kinoshita: It is a tough process but it's fun. Watanabe: When it comes to a photographer, don't you think there's a similarity? You have a limited amount of time when you shoot, and at the same time, we can't sketch forever for the same reason. Nakamichi: To be honest, sensuously speaking, the process of creating these pieces was similar to sketching. One complete work, two, three four … it was fun. I was moving my hands as I imagine, just like sketching. "By combining these two pictures, I get to see the correlations!" Kinoshita: Did you come up with all the compositions by yourself? Kinoshita: But you didn't actually see some of the architectures. Nakamichi: That's right. But by looking at the pictures, so many ideas emerged. Can this be called an essence of you two? Since I've known you for a long time, I get to explore so much just by looking at the pictures. It's so-called an attachment! Watanabe: Mr. Nakamichi adores photography. So it's rather an attachment to photography, not us! Kinoshita: Taking a photo with an attachment to architects ? that's implausible unless you know the subject well and understand what architects had in their mind. Watanabe: But Mr. Nakamichi answered to it with love, and fantastic exhibits had born. Kinoshita Mr. Nakamichi said "taking pictures with a love and an attachment to architects." In order to do that, you need to know the subject and understand what architects had in their mind. Such attitude exists as a basis of this project. Nakamichi: I've been taking pictures for 30 years and for the entire career, I've been with Nacasa and Partners -- meaning I only know this style of photo shooting. When I am shooting, I don't go like "I should take it in this way, because I think this is the best." If a shooting object is architecture, it is important to understand what architects had in their mind when designing. Kinoshita: Such attitude is similar to our architectural approach. Especially, if it is a residence, we don't have one particular style. Rather, we are trying to seek "what's best for a client" while interviewing with a client. Sometimes, we are more like a psychiatrist. Mr. Nakamichi once said, "A great part of photo shooting is to find an angle that an architect never thought about." We also have that in the process of design. For instance, a residential project. When I am talking to a husband-wife client, I look at a person that talks less, and look for what she wants to express. This process is interesting. By conversing with Mr. Nakamichi's work, I found out that the attitude of photography and our design attitude have some sort of similarity. From the ADH architects works photographed by Nacasa and Partners, "Apartments Shinonome Canal Court" by Atsushi Nakamichi, "IS House", "TK House", "Tama Unicersity Shonan Campus" by Satoshi Shigeta, were chosen. 4 to 5 images are chosen for each architecture, and they are superimposed by a computer. Please click the above works for large displayed.